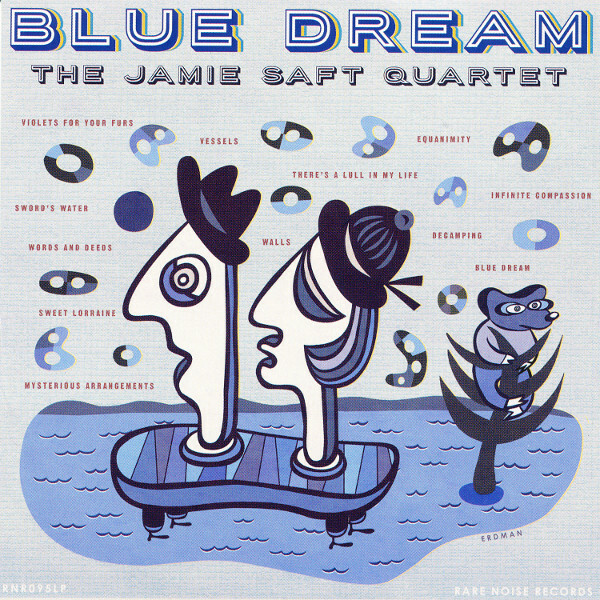 This quartet, like his trio with Steve Swallow and Bobby Previte, represents the more traditional jazzy side of Jamie Saft’s work. As in the trio, Saft limits himself to piano, and his cohorts are Bradley Christopher Jones (upright bass), Nasheet Waits (drums), and Bill McHenry (tenor sax). The tunes are mostly Saft originals, with three outside compositions, one of which is a well-known standard, though the other two are lesser known. “Sweet Lorraine” has been done many times, and Saft’s take on it is fairly straightforward, with an easy swinging gait and relatively simple chording — no unexpected chord substitutions or anything — and McHenry stays with a smooth, breathy tone on the tenor a little reminiscent of Coleman Hawkins’ ballad playing. Aside from the clarity of the recording, it could date from 50 years or more ago. “Violets for Your Furs” is a song rarely done these days, in spite of having been done by Billie Holliday, Frank Sinatra, John Coltrane, and a few others. Saft gives it a lilting bounce, playing it straight with only minimal improvisation. Lastly, there is “There’s a Lull in My Life,” another uncommon old tune with a history including Ella Fitzgerald, Nat King Cole, and Tony Bennett. This one is given a bit more room to grow and breathe, though still kept very much on the old-school side. These three covers act as a touchstone for the original tunes, with each appearing after a set of two to four Saft compositions, which are all much more loosely written, and clearly a product of the post-Love Supreme era, at least conceptually. The quartet absolutely never engages in the kind of forceful playing that John Coltrane was known for, so that a casual listener might not notice that the pieces are built on the kinds of modal and non-blues-based structures found in “Giant Steps” and other groundbreaking pieces of the 60s. Many of the tracks feature a harmonic structure that seems to be composed, but lack a set melody. It’s almost as if the quartet learned some tunes which did have melodic heads, worked out arrangements, and then chose to eliminate the heads, leaving just the improvised sections. Saft’s playing is as fine as ever, bringing many of the aspects found on his Solo a Genova album into a small group setting. McHenry is, as mentioned, generally subdued and melodic, though he breaks out of that at times — never to the level of screeching, but with some passages of intense phrasing. Jones and Waits similarly bridge old and newer styles. The inclusion of the standards in this context sets up what seems to be the theme of Blue Dream, namely the linking of old and new, of applying established patterns in new ways. There’s a subtlety to this that may not reveal itself on casual listening, which may come off as more or less the same as what you could hear in any of a thousand retro cocktail lounges. Closer attention is rewarded, however, and an awareness of history certainly helps.